HTC’s Tablet UI Will be Known as “Sensation”? 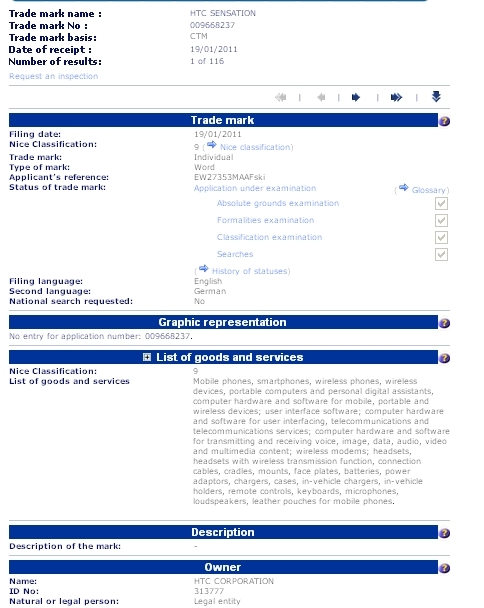 According to a trademark filed over in Europe on the 19th, HTC is looking to take control of the words “HTC Sensation” leading many to believe that this will be the name for their tablet skin. “Sensation” could work. We all know that HTC’s custom UI for their phones goes by the name “Sense” so why not bring in a new off-shoot for their line of tablets that are expected to be here in the first half of 2011? Mobile phones, smartphones, wireless phones, wireless devices, portable computers and personal digital assistants, computer hardware and software for mobile, portable and wireless devices; user interface software; computer hardware and software for user interfacing, telecommunications and telecommunications services; computer hardware and software for transmitting and receiving voice, image, data, audio, video and multimedia content; wireless modems; headsets, headsets with wireless transmission function, connection cables, cradles, mounts, face plates, batteries, power adaptors, chargers, cases, in-vehicle chargers, in-vehicle holders, remote controls, keyboards, microphones, loudspeakers, leather pouches for mobile phones. What’s interesting, is the fact that I’m OK with seeing this filing and have no problem with HTC wanting to put a skin on their tablets. Sense UI is about as polished as it gets, and in some cases actually enhances their devices. While we know that instant pain is initiated at the mention of Motorola’s Blur, we actually don’t mind Sense.